Even though it was two years ago, I still have tears in my eyes when I think about that 5 km run on a chilly May day in Stockholm. The story began many years ago in my mother country, Russia, when my doctor cautioned me to not run or partake in any physical training. For an active kid like me it was quite harsh to accept. Even my parents, for my own good, took away my bike and roller blades! I remember that day clearly, so clear that I still see that bright white medical coat with the name badge reading ”Surgeon Ivanov.” “You will never run”, – I heard again and again. At the age of eleven, I developed a strange disease called phlebeurysm on my right leg. It looked so awful that I wouldn’t wear shorts or skirts for the following nine years, and I constantly wore bandages on my one leg to reduce pain. At age 20, the doctors agreed that I needed to have surgery. So I underwent the surgery and six months later I hired a swimming instructor. Soon after that, I managed to create a small club comprising of six friends, which we ended up naming “The Dolphin Club.” I started swimming but I still was not running. A few years later, I moved to Sweden. Sweden is an amazing country for several reasons. To name a few— the people are attractive and tall, the city streets are extremely clean and green, and nearly everyone speaks English. One aspect about Sweden I find…nice, is unlike the smaller towns here, Stockholm is absolutely jumping with sports-minded people. At any time of the day bumping in to a runner is likely to happen on the streets here in Stockholm—so stay alert. 5 km run: Let’s do it! A friend of mine, Alona, once asked me if I wanted to join her on a 5 km girls run. “It would be cool… let’s do it!” She said. So I thought, hmm…yes I theoretically can run…I think almost everyone can somewhat run…and I’ve been swimming a lot lately and that’s serious cardio. As it turned out, running was a completely new experience for my body. In the beginning, I could barely breathe after 1 km—I was power walking half the time! Even when I pushing myself the inside voice was telling “You will never run. You will never run”. But gradually I picked it up a notch or two and began running almost every day for an entire month. Maximum what I could do was 3 km. 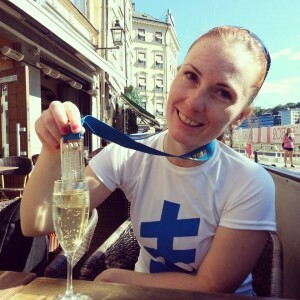 But nevertheless, I decided to participate in the 5 km run 2012 Vårruset. It was a nippy day, nothing out of the ordinary for Stockholm in May. Thousands of women in sport clothes were laughing, chatting and voicing their anticipation. The route was just on the edge of the city, crossing partly into the forest. The fresh smell of grass and wood made me happy, so I ran with a smile. Unbelievably, I remember crying while crossing the 2nd km post. I noticed two women—one confined to a wheel chair and the other one pushing it forward. Both of them were among all the other runners, fighters wearing big smiles. For some reason at that moment, I busted out in tears. At that moment “the wall” was broken. Crossing the finish line of 5 km. running –not walking, I cried again. And I’m a person who people call “strong and tough.” Yeah right. I busted out in tears 3 times in a half hour! There was a small group of people at the finish line, but I noticed a father with three kids. The smallest one was sitting on his shoulders and the older ones were standing by his side holding posters that read, “Heja på bästa mamma!” The journey is so much nicer when your beloved ones are waiting for you at the finish line. Now, sitting here writing this article, I am crying again and I don’t know why. Maybe its because I still remember surgeon Ivanov telling me that I am not allowed to run… and that I will never run. Yeah right. And now I am going to be an Ironman next year. Så fint skrivet, Anna! Du är så himla grym! Previous PostThree Secrets and a Big Passion – Triathlon!